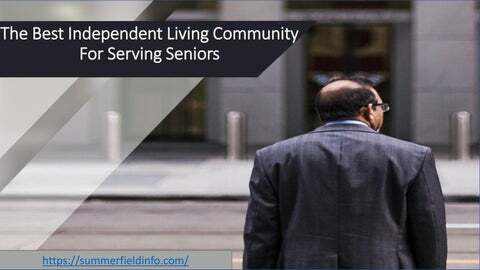 Independent Living Community Retirement living can be active, inspiring, and fulfilling. We know because we help make it a reality every day. Visit our retirement community and see what independent living is all about after retirement. • Freedom to do what you want – watch a movie, engage with friends, go out, relax in your room, have a snack – whatever you want. We will never let you forget this is your home. • Environment – we create a vibrant independent living community, bringing people together to form new friends and share experiences. • Food – an integral part of the Summerfield experience. Our in-house chef and dietitian ensure that we satisfy everyone's vision of a perfect meal – delicious, fresh, and filled with nutrition. • Skills – we believe that it's never too late to continue growing and exploring. Take advantage of the proximity to the freeway and explore new skills and adventures. • Vitality – at Summerfield, we are about people. We are in the business of health, happiness, and peace of mind. Making a senior’s life better is more than a vision; it's our purpose.